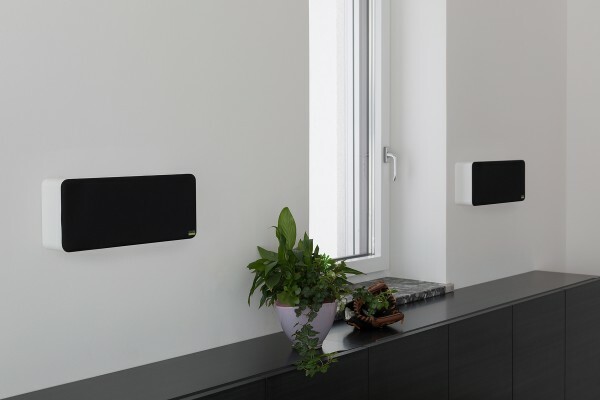 The new Loxone Wall Speaker will wow you with its solid construction, slimline design and top sound quality. This Wall Speaker sounds great, whether on the wall or on a shelf. Perfect for retrofitting. With its two woofers and one tweeter encased in a high-end chassis, the passive loudspeaker is perfectly balanced. So you never have to worry about any annoying noise coming from vibrating plastic housing! The PVC-coated wooden chassis not only gives the speaker stability when placed on a shelf or table, it also improves the quality of the sound. With or without its cover – the Wall Speaker fits in perfectly with its surroundings. Did you know that the wall speaker, whilst being designed for simple wall mounting, can also be free-standing? So whether you prefer to place it in the kitchen, on your desk or high up on a shelf, the Wall Speaker will fit seamlessly into your home. The Wall Speaker comes with a template making it very easy to mark exactly where on the wall the holes need to be drilled.